We’d love your help. Let us know what’s wrong with this preview of Let Freedom Ring by Adolfo Pérez Esquivel. Let Freedom Ring presents a two-decade sweep of essays, analyses, histories, interviews, resolutions, People’s Tribunal verdicts, and poems by and about the scores of U.S. political prisoners and the campaigns to safeguard their rights and secure their freedom. In addition to an extensive section on the campaign to free death-row journalist Mumia Abu-Jamal, represented her Let Freedom Ring presents a two-decade sweep of essays, analyses, histories, interviews, resolutions, People’s Tribunal verdicts, and poems by and about the scores of U.S. political prisoners and the campaigns to safeguard their rights and secure their freedom. In addition to an extensive section on the campaign to free death-row journalist Mumia Abu-Jamal, represented here are the radical movements that have most challenged the U.S. empire from within: Black Panthers and other Black liberation fighters, Puerto Rican independentistas, Indigenous sovereignty activists, white anti-imperialists, environmental and animal rights militants, Arab and Muslim activists, Iraq war resisters, and others. Contributors in and out of prison detail the repressive methods--from long-term isolation to sensory deprivation to politically inspired parole denial--used to attack these freedom fighters, some still caged after 30+ years. This invaluable resource guide offers inspiring stories of the creative, and sometimes winning, strategies to bring them home. To ask other readers questions about Let Freedom Ring, please sign up. The Sixties presented social movements with some of recent history's most spectacular schisms, many of which continue to be debated. Assimilation versus revolutionary nationalism versus cultural nationalism; and Old Left aesthetics versus New Left rejection of convention were among them. But none so clearly defined the troubles of that period like the verbal and other skirmishes over militancy. Pacifism, the use of political violence and the peculiar merging of the two that came to be called self The Sixties presented social movements with some of recent history's most spectacular schisms, many of which continue to be debated. Assimilation versus revolutionary nationalism versus cultural nationalism; and Old Left aesthetics versus New Left rejection of convention were among them. But none so clearly defined the troubles of that period like the verbal and other skirmishes over militancy. Though it isn't about those debates, Let Freedom Ring: A Collection of Documents from the Movements to Free U.S. Political Prisoners cannot be divorced from such either. The massive tome, spanning over 800 pages, endeavors to tell the story of political organizing primarily from the aforementioned period, along with the narratives of individuals incarcerated for activities in alliance with same. The definition of 'political prisoner' is most assuredly to be contentious, for in this reading, such encompasses individuals who have taken up political violence as a means to an end. Such a designation, to hear groups like Amnesty International tell it, obscures non-Western activists' tribulations and the spirit of political resistance. Or does it? Meyer makes a persuasive case for consideration. 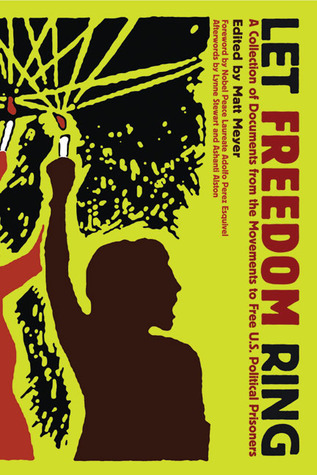 Let Freedom Ring brings together scores of previously released documents, featuring former combatants from a constellation of North American organizations including the Black Liberation Army, Weather Underground and more. Many of these writings would have otherwise been lost, and the service Meyer does in capturing a critical though largely unknown call to free those imprisoned for actions associated with political demands in the United States is bold. Few areas in the realm of such trends are left unaddressed. Race, history, public policy and revolutionary arts are among the themes writers cut into. Meyer should also be applauded for avoiding old-school divisions around political orientation; Earth Liberation Front sabotage, for example, is discussed with the same level of seriousness Puerto Rican liberation campaigns are, and each is presented as part of a larger vision for freedom. Gender and sexism are also plumbed, though more might have been offered. Consider books like Personal Politics: The Roots of Women's Liberation in the Civil Rights Movement & the New Left by Sara M. Evans to supplement some of Let Freedom Ring's offerings.